Hello friends, here is a great good news for you all careerassam.in readers. Here we bring Darng District Teacher Recruitment. So, Read this article for the proper information of the recruitment. Application is invited from the H.S. 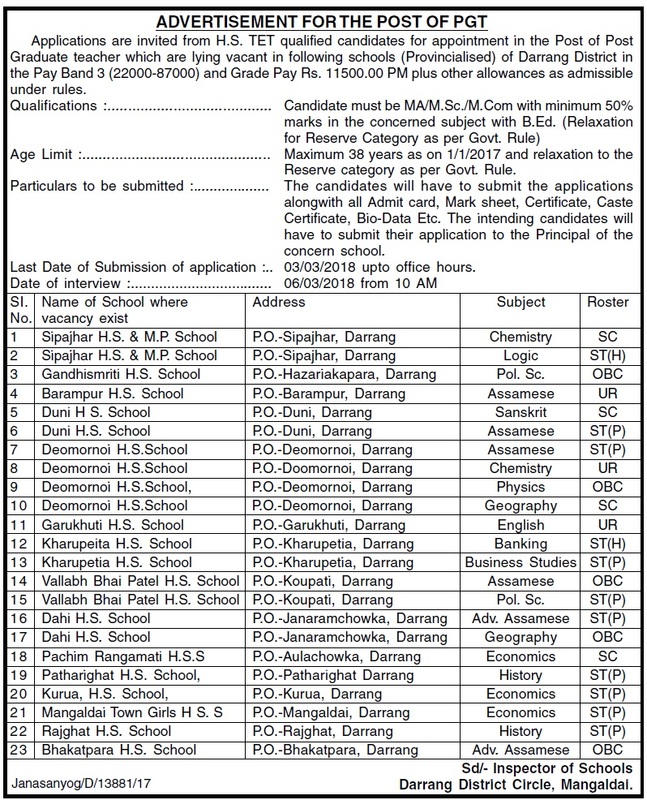 TET qualified candidates for appointment for the post of post guaranteed teacher which are lying vacant in following provincialized Schools of Drang district in pay band 3 i.e. ₹ 22,000 to ₹87,000 and grade pay ₹11,500 per month plus other allowances as admissible in the rule. Selection Process (বাচনি প্ৰকৃয়া):/h2> There will be personal interview for the Above post. Monthly Pay (দৰমহাৰ নিৰিখ): Pay Band 3 i.e. ₹ 22,000 to ₹87,000 and grade pay ₹11,500 per month plus other allowence as admisible in rule. Eligibility Conditions: Candidate must be H.S. TET Qualified. Age Limit (বয়সৰ সীমা): Maximum 38 years as on 01.01.2018 and relaxation to the reserve category as per govy. rule. Educational Qualification (শিক্ষাগত অৰ্হতা): Candidate must be M.A. or M.Sc. or M.Com with minimum 50% marks in concerned subjects with B.Ed. Relaxation for reserved category as per govt. rule. The mode of appliction process is offline. The candidate have to submit the application form along with necesary documents to the office of the principal of the concern school. The candidate have to submit the aplication along with all admit cards, mark sheets, certificate, cast certificate, Bio Data etc. 3 Gandhi smriti H.S. School P.O: Hazarikapara, Darang Poi. Sc. 15 Ballabh Vai Patel H.S. School P.O: Kaupati, Darang Pol. Sc. For more information Visit office of the inspector of School, Darang District. There will be personal interview for the Above post.